You are here: Home / In the Kitchen / Blueberries …… or Huckleberries? Wild blueberries always make me nostalgic. 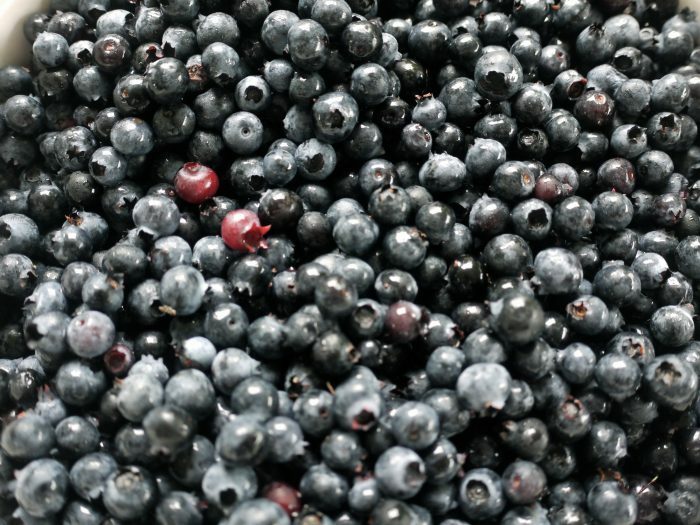 My family spent summers at a beautiful mountain lake and blueberries were abundant on the mountain. Mom would make pancakes in the morning and we would run out into the yard in our pajamas to gather just enough berries to add to the batter. Of course, we always called them huckleberries. To us, a wild berry was a huckleberry, and a cultured berry was a blueberry. Over the years, I’ve realized that there are numerous definitions for these terms depending, I guess, on local custom. Some say that low bush berries are huckleberries and high bush are blueberries. Others say it the size of the seed that determines the name. So, Mike went berry picking yesterday and came home with 5 quarts of wonderfulness. Today, I made two pies and several half pints of jam, using the same recipe I use for Strawberry Maple Jam. Wonderfulness turned into even more wonderfulness! 1. Beat sugar, butter and eggs. Stir in milk, flour, baking powder and salt. Gently stir in blueberries. 2. Spoon into a greased and floured 9" x 13" cake pan. 3. Combine the ingredients and sprinkle over the top of the cake batter. 4. Bake for 45 – 50 minutes at 375°F. Yum, I miss those little berries already! I sure hope you find your patch real soon! I have planted my own Huckleberry patch. Got seeds from Baker Creek seeds. Planted and harvested both this year. Holly, thanks for visiting! How long did it take from seed to maturity? They are all over Montana. Drive up almost any old logging road to about 4,500 feet and you will find huckleberries. My general rule is “9 mile up”. I can’t spot them from the road like some people but if you get out and hike you will find them. From my experience, huckleberries are a specific berry that grows in Western Montana and Northern Idaho. I’m unaware of other locations that may have huckleberries, but they are not to be confused with blueberries. We have plenty of wild berries (high and low bush), but there is only one Huckleberry! Susan K: Try Priest Lake ID. (legendary picking) or talk to people around town – they may not tell you their ‘secret spot’ but they can usually direct you to a place with a few berries. Learning and yearning: Baker Creek (rareseeds.com) says it’s 75 days to maturity for their Garden Huckleberry. This is not a true Huckleberry as it must be cooked and should not be eaten raw. Real huckleberries are incredibly sweet and flavorful right off of the bush. The picture doesn’t even look like a huck. From what I have read, I’m sure you are correct, but don’t try to tell that to an old timer in PA. 🙂 Thanks for visiting. I live in southern Louisiana and we have huckleberries here. I have dug bushes in the winter and planted about 10 in my patch. This year has been a bumper crop and they are still coming. I agree that the picture doesn’t look like a huckleberry. Well Missoula area always has huckleberries but our family has always found them around the lakes like Flathead, Seeley and Swan, they’re just about everywhere on the westside of the mountains. You could probably find some up in the Scalcahoe (sp) by you. My dad grew up in Libby so he always likes to go that direction when looking to pick our own. Any more when we don’t have time we go to Msla and buy them at the farmers market where this yr they seem to be selling for about $50/gallon. We happened to be in Big Fork last week so we bought a couple gallons for $40/gallon. I’m sitting here eating a few with cream and sugar and boy are they TERRIFIC!!! Good luck! Huckleberries thrive in old burn conifer forests 3,500 to 7,000 feet. They can not be transplanted for garden growing because they required the high elevation for growing. There are two varieties but they are in the same genus. One is about pea-size and has a red tint to it. The other is smaller and definitely purple. (The berries in the above picture appear too blue to be a northwest wild huckleberry). The wild mountain huckleberries of the northwest are very sweet and can be eaten off the bush. My kids seem to eat more than they collect. Most years, a quart of huckleberries sells for $40-$50. In extreme conditions, when the berries are not in abundance and the humans are fighting the bears for berries, they can be as much as $60/quart. Montana boasts nearly 4.6 million acres of huckleberry growing splendor. These look just like the ones we have on our property here in Northeast Florida. My dad showed me what the bushes look like years ago. I thought we had only 3 bushes for years, but this year my husband and I found about 50 in the woods. There were loaded and we were busy picking a little each day until Tropical Storm Beryl and Debby hit, it was too wet and snakey after that. We are looking forward to next years crop. Atleast I got enough for 2 batches of jelly. Create experiences that combine the magic of software with the power of Internet services across a world of devices. We camped on a lake I think was named Ocoee in NC a few summers. We picked what we thought were blueberries (this was about 50 years ago). So I a little fuzzy on specifics. We ate them with no I’ll effects and put them in pancakes every morning after. I remember the lake was blue like the ocean in Key West were I was born and still call home. I was told it was because of deposits of copper and cobalt in the surrounding strata. Wonder if it’s the same lake you visit. I certainly recall those tasty pancakes. Hi Felix, what wonderful memories!!! Our lake is in PA and the berries are fantastic!